Tan Chuan Jin used an illustration [here] of a low income family living beyond their financial means, to justify the affordability of HDB flat. Whether the aforesaid family is really living beyond their means is not a concern over here. The issue is confusing affordability of HDB flats with individuals’ poor financial planning. TCJ reasons, since people can choose to live beyond their means, public housing is deemed affordable. There will always be this group of people as there will always be a group of people who will use knife in a criminal way. But you cannot condemn the knife itself. 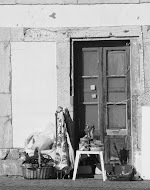 Affordability and living beyond one’s means are two separate issues, in my humble opinion. And they are independent of one another. If TCJ would scrutinize HDB pricing in the last 4 decades, probably he could get closer to understanding the unhappy noise about the affordability of HDB. Looking across all types of HDB, prices for new flats have risen 14 -20 times in the last 4 decades. If we zoom into the last decade, the inflation is 100% for 3 room flats, 63% for 4 room flats and 55% for 5 room flats. For 4- to 5-room flats, the increase maybe smaller in terms of percentage but bigger in absolute amount. The average price difference for new 5 room flats in the last decade is $158 700, higher than 3 room flats’ difference of $150 100. Is that an affordable increase? Assuming that takers for new flats to be young families/couples with young careers, we have to match the housing inflation with the starting salaries for young people with proportionate increase of 55% to 100%. Did starting salaries increase at least 50% over the last ten years? If it did not, there will be an implication of young families shouldering a heavier burden than young families 10 years ago. Using teaching salary as a guide, the increase in starting pay for an honours degree female teacher trainee is approximately 12.7% for the last decade. Far from matching the housing price increase. 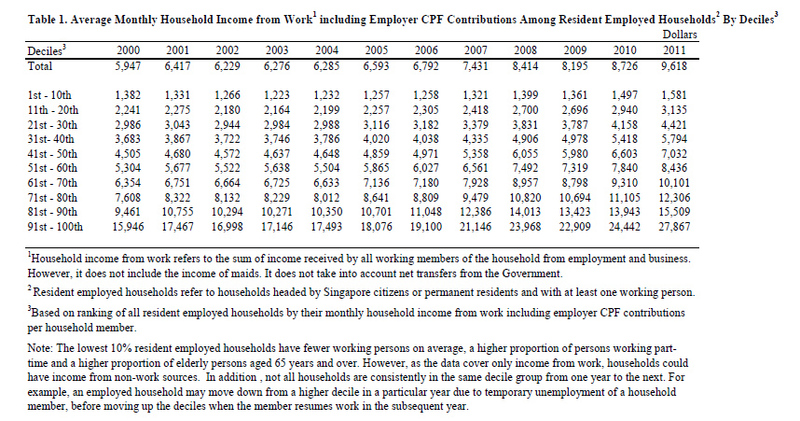 In considering the affordability of our HDB flats, TCJ should also take a look at our average monthly household income (Table 1) to grasp the realities on the grounds. Average monthly income grew from $5947 to $9618, a 62% increase and this increase mainly comes from households from the 61st and above deciles. Below the 60th deciles, household income rises less than 60% and the percentage diminishes as it moves up to the 1st and 10th deciles. In absolute amount, the 62% increase in average household income will not suffice to catch up with that increase of the housing price as the housing price is greater to start with. A five-room flat in the 2000s stood at $290 000. A 10% increase in price will bring about $29 000 difference in price. In this light, young households have to stretch their housing loan longer and eat into their retirement funds to service their loans. Is this affordable? For lower average monthly income families, between the 1st to 10th deciles, average monthly household income rises only 14% in the last 10 years. It is most apparent that prices of new HDB flats are priced out of their means. Unaffordable housing will remain unaffordable despite prudent financial planning. Prudent family will probably resort to squeezing a family of six into a 3 room flat when 5 room flats are financially out of reach for them. They can only afford 3-room flats. That does not reflect the affordability of HDB flats at all. It only points out the contrary. I can’t help but smelling a rat over here. The habitual use of a group of certain “irresponsible” individuals to justify any poorly formulated policies.